American health care organizations can no longer operate systematically, so participants are forced to act in the communal mode, as if in the pre-modern world. The formal systems of health care are broken under [my interpretation, to follow] the weight of regulation. By "formal systems" I mean the normal bureaucratic procedures by which large organizations run and interact: a set of rules, forms, records, and so forth. "Bureaucratic" here is not a pejorative. Bureaucracy is what allows large organizations to work. This isn't about technology -- for centuries large organizations worked well using the technology of paper, writing, forms, and files. Electronic records just make those structures work more efficiently. But when the rules and formal systems grow immense, vague, contradictory, and unworkable, human networks form in their place. Then things happen only by networks of personal connections, informal structures working around the dead elephant in the room to get anything accomplished. The latter, at great inefficiency, of course. Large bureaucratic organizations, allowing people to cooperate anonymously, are vital to an advanced society. It’s like one those post-apocalyptic science fiction novels whose characters hunt wild boars with spears in the ruins of a modern city. Surrounded by machines no one understands any longer, they have reverted to primitive technology. Except it’s in reverse. Hospitals can still operate modern material technologies (like an MRI) just fine. It’s social technologies that have broken down and reverted to a medieval level. To be specific, follow the author through a detailed personal story. The story takes a while, and it's one story, but the granularity of a story makes the case vivid. Alex M. Azar, U.S. secretary of health and human services, published an interesting OpEd in the Washington Post, describing a clever health insurance innovation. HHS will allow "temporary" health insurance, including a guaranteed renewability provision. The HHS announcement is here and the official rule on the Federal Register here. The big news to me is guaranteed renewability. You sign up now, and you are guaranteed rates don't go up if you get sick. It sounds like HHS is allowing this again. But I couldn't figure out from a quick read whether the guarantee only lasts 36 months, or if they can sell that option for a longer date. It sounds like the plain guaranteed renewability is only 36 months, the length of the contract. For newcomers to this blog, guaranteed renewability and the option to buy health insurance is the key to escaping the preexisting conditions problem in a free market for health insurance. I'm delighted to see the idea take hold, if at the edges. Great trees grow from saplings. You may ask, then, why only 36 months? As I piece it together, the ACA, which is still law, has a little carve out for temporary insurance, defined as a contract that last 12 months. Anything longer must meet the list of mandates. It sounds like HHS was pretty clever within the constraints of the law, allowing them to be renewed, so 12 months can turn in to 36. I presume you can sign up with another company after 36 months? But you lose the guaranteed renewability so the new company may charge you a lot. Unless, perhaps, they really are letting insurance companies offer the right to buy health insurance as a separate product, and that can have as long a horizon as you want? If they haven't done that, I suggest they do so! I don't think the ACA forbids the selling of options on health insurance of arbitrary duration. Let's transfer more technology to China, writes Scott Sumner, with approving comments from Don Boudreaux. They're exactly right, skewering one of the common backstop defenses of protectionists on both left and right. The question is whether China can buy US technology, or require technology transfer to Chinese partners as a condition of the US firm entering China. Scott and Don have sophisticated versions of my reaction: If Chinese access isn't worth it to you, don't do the deal. It stands to reason that stealing technology and IP is bad, and should be stopped. 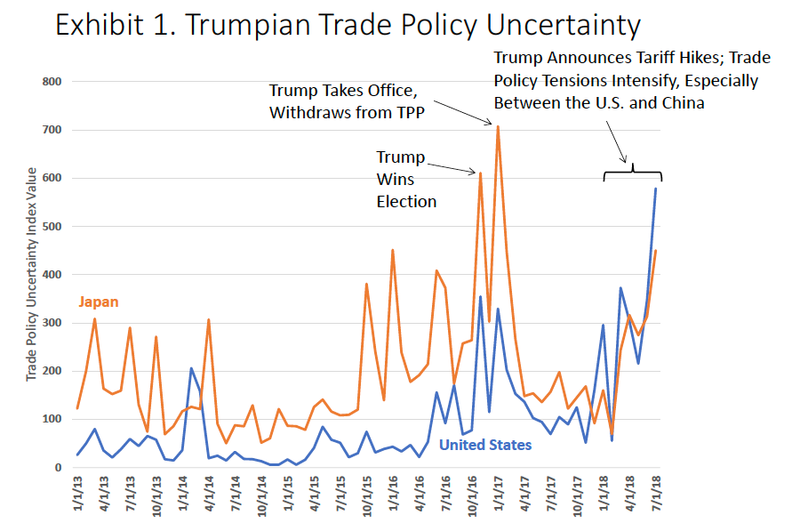 Whether imposing tariffs is the smart way to do that, we will discuss another day. But on an economic basis, even that is questionable! If I know how to wax my car in half the time it takes you, and you sneak in to my house to learn my secret, you wax your car in half the time too. But so do I. Well, that sounds reasonable no? If 100% of the country's currency and bank reserves are backed by US dollars, and the currency is pegged to the dollar, what could go wrong? Don't want Lira? The central bank promises to exchange 1 Lira for 1 dollar and always has enough dollars to make good on the promise. It sounds like an ironclad peg. Government debt is the problem. Turkey may still have the resources to back its currency 100% with dollar assets. 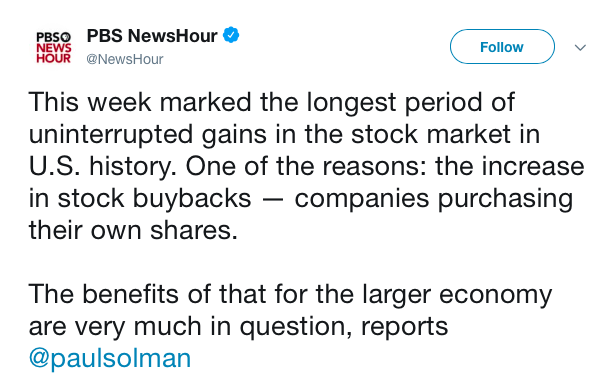 But what about the looming debt? Turkey does not have the resources to back all its government debt with dollar assets! If it did, it would not have borrowed in the first place. So what happens when the debt comes due? If the government cannot raise enough in taxes to pay it off, or convince investors it can raise future taxes enough to borrow new money to roll it over, it must either default on the debt or print unbacked Lira. I.e. a currency board run by an insolvent government will fail. The government will eventually grab the foreign reserves. The Argentinian currency board did fail, and this is basically why. 1) Prefab housing in Berkeley and Alex Tabarrok Commentary on Marginal Revolution. Imagine a four-story apartment building going up in four days, and from steel. It happened in Berkeley, a city known for its glacial progress in building housing. The modules were stacked on a conventional foundation. Electricity, plumbing, the roof, landscaping and other infrastructure were added. Housing should be manufactured. As Tabarrok points out, it is one place where productivity has not improved much. I gather Ikea is now moving in to manufacture housing (I lost the link). Economies of scale should make a big difference. Once Ikea does to housing what they did to the Poang chair, steadily refining it, they can bringing the price down a lot. But, manufactured houses have to obey local building codes too, and planning review and design review, and inspections, and all the other little local obstacles. Getting a uniform code will be a big fight, but strikes me as necessary to reap those economies of scale. The prefab houses are made in China, using steel. A bunch of obvious meditations follow. As I understand it, we now have import taxes (tariffs) on raw steel from China, but not taxes on products made out of steel. Why does the Trump administration so obviously provide an incentive for manufacturing to move to China? I've read a lot of stories about keg manufacturers, steel locker manufacturers, and so on going out of business over this difference. Is there some part of trade law that I don't know about that forces this outcome, and forbids them to also tax steel content of imports? It nicely illustrates the point, that if you don't let people come to the US, the capital can go there. Even homebuilding. 2) Greg Mankiw makes an excellent point about marginal tax rates. Phil Gramm and Robert B. Eklund wrote a great WSJ oped pointing out that inequality in the US really is not as large as it seems, because most measures left out government transfers, even cash transfers. (They cite the CATO study by John F. Early.) Once you add transfers back in again, the US has a much flatter income distribution. We have a more progressive tax system than Europe, with no VAT and lower payroll tax rates, and we do a lot of income transfers. The bottom quintile earned 2.2% of all earned income in 2013, but after adjusting for taxes and transfer payments, its share of spendable income rose to 12.9%... The second quintile’s share more than doubled, rising from 7% of earned income to 13.9% of spendable income. For the third quintile, middle-income Americans, the increase was much smaller, from 12.6% to 15.4%. .. the effective marginal tax rate when a person moves from the bottom to the middle quintile is 1 - (15.4-12.9)/(12.6-2.2), or 76 percent. 76 percent! The average person in the lowest quintile of the income distribution who earns an extra dollar, gets to keep only 24 cents. Can you spot the disincentive to work, or get an education? Greg says something about heterogeneity that I did not understand, but it strikes me that heterogeneity makes matters worse. Hetereogeneity means people are different. Some people are at a cliff: make one more dollar, lose medicaid or another service. Some people are not. But if 76 percent on average means half the people face a 100% marginal tax rate and half face a 50% marginal tax rate, I think this means the overall disincentive effects are worse than if everyone faces 75% tax rate. In that circumstance half the people will not work at all. Sometimes in economics heterogeneity makes things worse, sometimes better. I think this is a case of worse, but I would be curious to know if there is a standard answer. In lieu of providing affordable units on site, Kennedy will pay a fee to the city of Berkeley’s Affordable Housing Trust Fund, as required under the city’s affordable housing laws. The amount is around $500,000, he said. Someone needs to write an expose of "affordable housing" programs. Who gets them and how? And once in, disincentives to earn more money, or take a better job in another city must be immense. It's also another hidden cross-subsidy driving up prices. If susttained protection from foreign competition was a useful path to the highest levels of efficiency and cost-effectiveness, then US ship-building and shipping should be elite industries. But in fact, US ship-building and shipping--safely protected from competition-- have fallen far behind foreign competition, with negative costs and consequences that echo through the rest of the US economy--and probably diminish US national security, too. ...After nearly a century of protection from foreign competition, costs of ship-building in the US are far above the international competition. "American-built coastal and feeder ships cost between $190 and $250 million, whereas the cost to build a similar vessel in a foreign shipyard is about $30 million. Unsurprisingly, the high cost of shipping by water means that in the US, freight is instead shipped overland. Consider, for example, all the trucks and trains that run up and down the east coast or the west coast. A long time ago when I was a CEA junior staffer, I got to see a bright idea die. The idea: Let's allow the US to export oil from Alaska to Japan. (There was an oil export ban, part of the legacy of 1970s energy policies.) Then use the money to buy oil from Saudi Arabia to send to the east coast. It's the same thing as sending Alaskan oil to the east coast but much cheaper. Everyone said great idea until the congressional liason said those ships from Alaska to the east coast are Jones act ships, and here is their list of threats if you do it. End of idea. I hear even from formerly sensible correspondents now mad for tariffs that we need steel tariffs for national security, so we can fight WWII again, I guess. Well, the Jones act is a nice test case since much of its rationale is to keep a merchant marine going to staff all those liberty ships. Tim (and, really, Colin, Inu and Daniel) demolishes even the national security argument. As with steel, if the goal is national defense, let the defense department ask for appropriations to staff a mothball merchant marine, don't force a hidden cross subsidy into the price of everything else. auto-sector “rules of origin,” which dictate how much of a vehicle must be made in North America to qualify as duty-free when it crosses continental borders. In May, Team Trump proposed a new North American content requirement of 75%, up from the current 62.5%. It also wanted a new requirement that 70% of the steel and aluminum in Nafta vehicles be North American and new wage regulations that would require 40% of the value of North American cars and sport-utility vehicles—and 45% of Nafta trucks—be produced by workers making between $16 and $19 an hour. Mexico countered with 70% North American content, a 30% regional steel requirement and 20% regional aluminum. Market-based labor rates are important for Mexican competitiveness, but Mexico showed flexibility by proposing $16 an hour for 20% of the value of vehicles it makes. The U.S. rejected that offer. Now the two sides are trying to find middle ground. Nafta and the like are often called "free trade agreements." Economists like me wonder, why does that take tens of thousands of pages? "We do not charge border taxes (tariffs), nor restrict quantities, nor will government purchases favor American companies." "We do the same." Done. That's free trade. This little snippet reminds us what trade pacts really are. Of course, they are far better than the alternative, in which everything is tariffed, protected, managed, and individually negotiated. Homeowners. So says a nice WSJ op-ed by Rob Arnott and Lisa Meulbroek, and a proposal by Chicago Fed Economists Thomas Haasl, Rick Matton, and Thomas Walstrum. The latter was a modest proposal, in the Jonathan Swift tradition. Despite Crain's Chicago Business instantly labeling it "foolish," "inhumane," and "the dumbest solution yet, the first article points out its inevitability. If indeed courts will insist that benefits may not be cut, then state governments must raise taxes, and this is the only one that can do the trick. States can try to raise income taxes. And people will move. States can try to raise business taxes. And businesses will move. What can states tax that can't move? Only real estate. If the state drastically raises the property tax, there is no choice but to pay it. You can sell, but the new buyer will be willing to pay much less. Pay the tax slowly over time, or lose the value of the property right away in a lower price. Either way, the owner of the property on the day the tax is announced bears the burden of paying off the pensions. There is a an economic principle here, the "capital levy." A government in trouble has an incentive to grab existing capital, once, and promise never to do it again. The promise is important, because if people know that a capital levy is coming they won't invest (build houses). If the government can pull it off, it is a tax that does not distort decisions going forward. Of course, getting people to believe the promise and invest again after the capital levy is... well, let's say a tricky business. Governments that do it once have a tendency to do it again. In sum, a property tax is essentially the same thing as the government grabbing half the houses and selling them off to make pension obligations. And unless a miracle happens, it is the only way out. Update: We're there already, say Orphe Divounguy, Bryce Hill, and Joe Tabor at Illinois Policy. The bulk of recent increases in property taxes have gone to pay for pensions, not more teachers, police, etc. Update 2: I should clarify, that I found this an interesting piece of economics more than anything else. I do not think this is the right solution, nor is it the only one. Most other countries around the world, having made unsustainable pension promises, find some way around them and reduce pensions. It happens. Some sort of federal bailout is not unthinkable either. Moreover, the suddenly announced surprise once and for all property tax increase is unlikely, see update 1. So the states are likely to reap many disincentive effects of expected increases in property and other taxes. Finally, most importantly property tax payers vote! They are unlikely to sit still for such a mass expropriation of their wealth. The BEA just revised the personal saving rate, and doubled it. 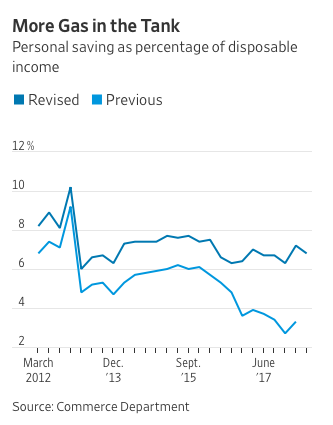 Previously, it looked like much of last year’s acceleration in consumer spending came by dipping deeper into savings, a sign of an expansion in its later stages. 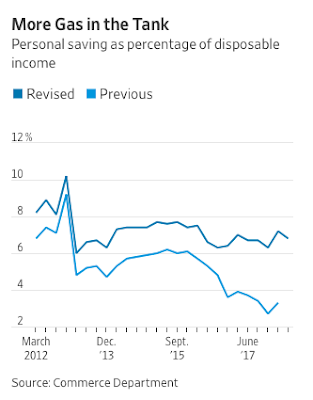 The Bureau of Economic Analysis has since found wages and self-employed income were much higher than it first estimated, so the saving rate, instead of sliding to around 3%, stands at 6.8%—in line with its average since 2012. The expansion now looks middle-aged (albeit late middle-age) rather than old. The definition should conform to the question. If you want to know whether Americans are prepared for retirement, then the average saving rate doesn't really matter, and you should include social security and medicare. If you're worried about debt buildup, then you're worried about some households saving too little and others saving too much, not the average. If you want to think about the trade balance and capital formation, then you want the national saving rate and don't include social security. And so forth. Economic policy is also schizophrenic about saving. Half of the time hands are wrung that Americans don't save enough. 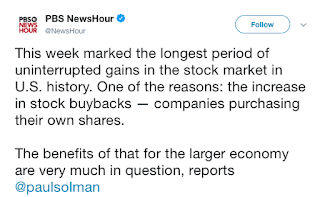 The other half -- or really all the time -- policy pundits want Americans to consume more in the name of stimulus, meaning save less, or worry about "savings gluts" driving asset price "bubbles" or "secular stagnation." I couldn't find the BEA's explanation of what changed. It's something to do with finding more income among self-employed people, and I guess more income - the same consumption = more saving. But where was that income before? If blog readers know where the BEA explains the change in methodology or can comment directly, send a comment or an email. Thus, the saving rate changed because the IRS made an adjustment, and thus the BEA made an adjustment. A few pieces I read over the last few days juxtapose nicely on the state of America today. To be clear, I am not calling for an end to the culture war. Indeed, it can and must be fought. Intense disputes over social issues are a feature, not a flaw, of a functioning democracy.